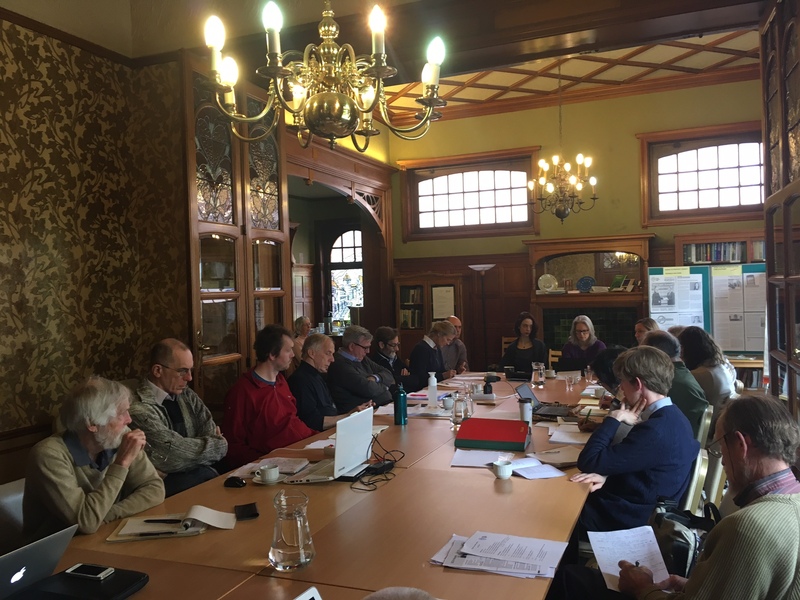 We met in Brussels on 7-8 April 2017 as the Quaker Council for European Affairs (QCEA’s) General Assembly of European Yearly Meeting representatives. Building on forty years of experience and support from Yearly Meetings, this was our first gathering since we changed our constitution and direction last October. This new era for QCEA comes just at the right time to live out our witness in newly focused workstreams of peace and human rights, giving a new context to Quaker traditions of advocacy, quiet diplomacy, bridge-building and networking across Europe. As we complete our transition programme, we have confidence and hope that by this new approach we can really make an effective contribution to peacebuilding and dialogue in present-day Europe. With our staff, we have found the courage to continue speaking with decision-makers who have approaches profoundly at odds with our own and find new ways to move away from militarised solutions. In 2017, QCEA will also be examining immigration detention, in particular by shining a light on detention of children in Europe. We are developing a comprehensive strategic plan which underpins the programme of work for our staff team, and hope to finalise that at our October meeting this year. We believe we are better able to articulate what QCEA does and is inspired to achieve. In our discernment on our funding and financial planning, we see the need to identify additional new funding sources, and we reach out enthusiastically to Friends everywhere to sponsor our project work in whatever way they feel they can. We received and considered documents from two organisations: a declaration from a conference on faith and peace held in Croatia, and the draft Quaker response to the Conference of European Churches’ open letter on the future of Europe. We look forward to engaging with the wider family of Friends at this year’s QCEA Study Tour of European institutions (24 June–1 July), as well as our events with Woodbrooke Quaker Study Centre (9-11 February 2018) and our conference with Quaker Peace & Social Witness in Brussels on 1-3 December 2017, entitled Sanctuary Everywhere. 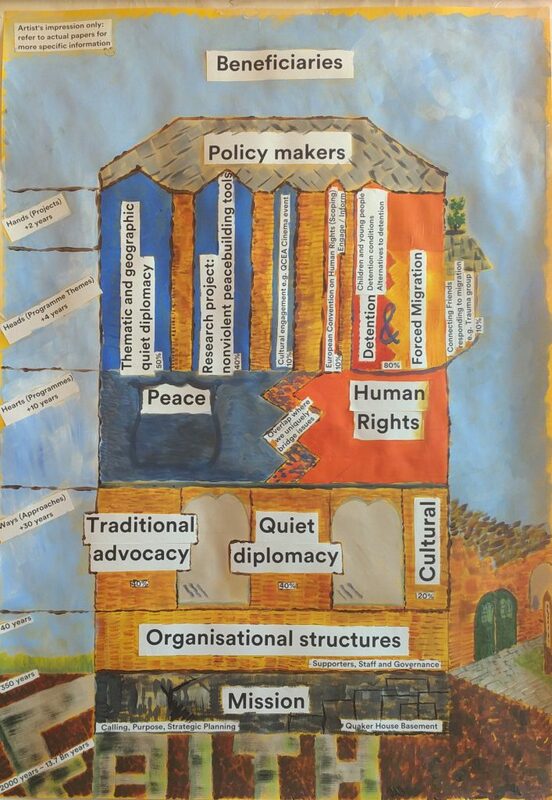 Visual representation of the work undertaken at Quaker House. 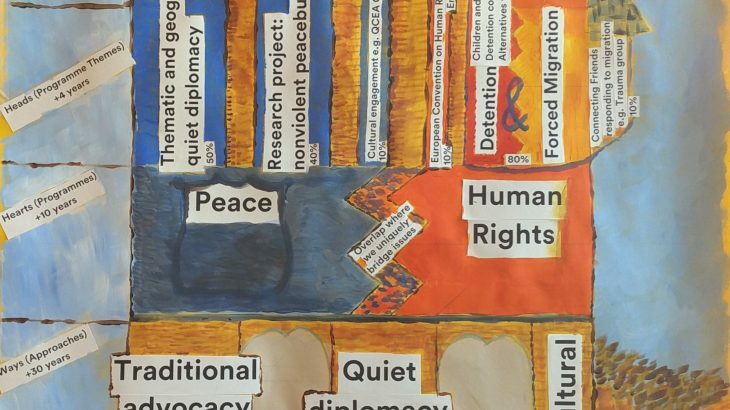 Human Rights, News, Peace Detention, Forced Migration, Human rights, Peace, Quaker House, Quiet diplomacy. permalink.